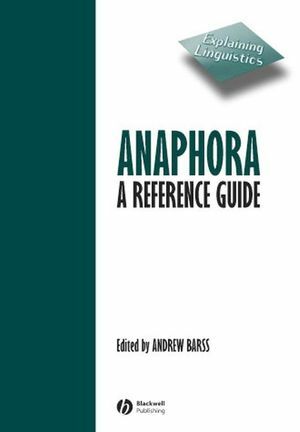 Anaphora: A Reference Guide is a collection of essays that report on the major results of recent research in anaphora and set the stage for further inquiry. Reports on the major results of recent research in anaphora and sets the stage for further inquiry. Features contributions from among the world's leading researchers on anaphora. Presents an exciting picture of how broad the phenomenon of anaphora is and how it can reveal many mysterious properties of language. Includes articles of interest to many disciplines, including philosophy of language, philosophy of mind, cognitive science, linguistics, language studies, cognitive psychology, and psycholinguistics. Andrew Barss is Associate Professor of Linguistics and Associate Research Social Scientist in Cognitive Science at the University of Arizona. His research interests include anaphora, movement phenomena, and scope; the syntax of logical form; derivational models of syntax and their relation to performance models; and competition-based models of syntactic form and the constraints they impose on semantic interpretation. 1. Timing Puzzles in Anaphora and Interpretation (Andrew Barss). 2. Two Types o0f Scrambling Constructions in Japanese (Ayumi Ueyama). 3. The Psycholinguistics of Anaphora (Janet L. Nicol and David A. Swinney). 4. Two Pronominal Mysteries in the Acquisition of Binding and Control (Dana McDaniel). 5. Reference Transfers and the Giorgione Problem (Mario Montalbetti). 6. Tense and Anaphora: Is There a Tense-Specific Theory of Coreference (Karen Zagona). 7. Surface and Deep Anaphora, Sloppy Identity, and Experiments in Syntax (Hajime Hoji). 8. The Logic of Reflexivity and Reciprocity (D. Terence Langendoen and Joel Magloire).